With a newborn this year, I wasn’t really sure how our Easter celebrations would go. 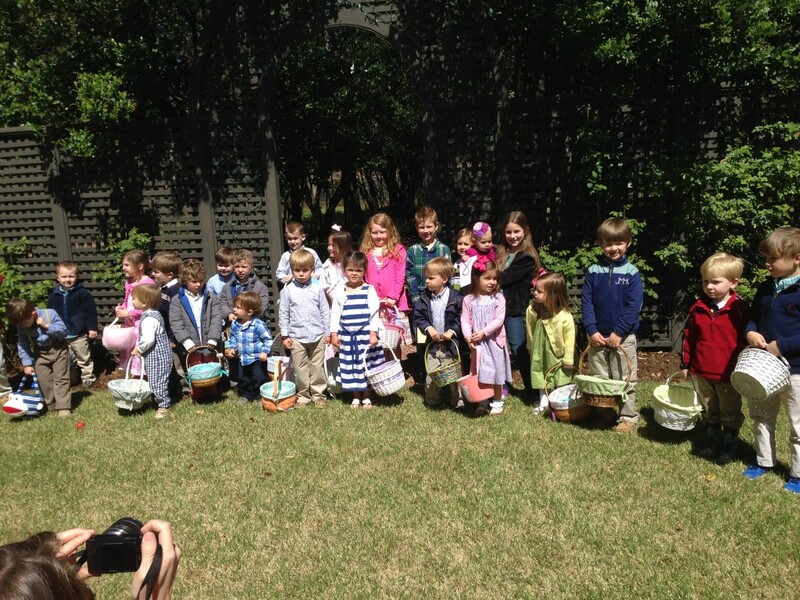 Last Easter, Todd and I said we wanted to host an Easter egg hunt for the kids in our Sunday school class on the grounds at his office. It’s a huge space and it’s beautiful and perfect for an Easter egg hunt. We did the hunt on Palm Sunday because everyone usually has family commitments on Easter Sunday. We kept it simple and did it pot luck style. Everyone pitched in and we had chicken and tons of delicious sides and desserts and ate picnic style outside. It was a little chilly that day, but all the kids had the best time! All the families brought about 50 eggs filled with candy and then the men hid them before lunch. There were TONS of eggs and the kids found them all. At one point, I had to remind Hayes to pick up eggs because he was just running with his basket and following the bigger kids. My parents came back into town to celebrate Easter with us. They don’t like missing holidays with the kids. We’re fortunate that Todd’s parents live here and can celebrate holidays with us, too. A few weeks ago, my mom and I were flipping through the new Southern Living magazine and we saw this recipe for a beautiful coconut cake. I don’t even like coconut! I don’t mind the smell or the flavor, but I can’t stand the texture of coconut shavings. So I’ve just never eaten coconut things. But this cake looked amazing because it used toasted coconut flakes! My mom was determined to make that cake, and it was a true labor of love. With all the steps and waiting for it to cool, it took all day! And after Easter lunch, we had the reward and it was amazing. Seriously, make this cake– even if you don’t like coconut! 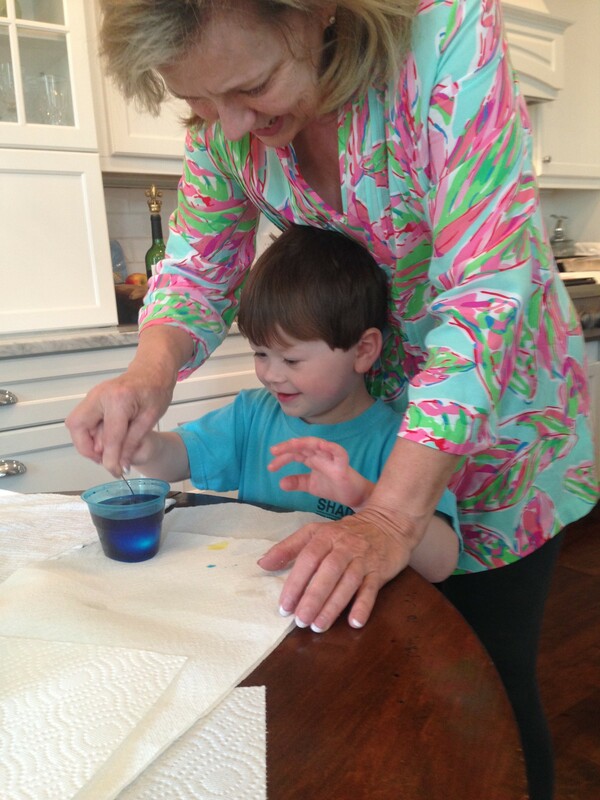 When my brother and I were growing up we always dyed Easter eggs the day before Easter. I can remember pretty much every time we ever did it. We even did it when we were in high school. I’ve done it with the kids, but this year I thought we’d just skip it. Hudson and Hayes hadn’t asked about it and I really just didn’t feel like doing it. But my parents really wanted to do it, and wanted to uphold that tradition and make that memory with the kids. On Easter morning, I was up early feeding James Walker and the boys got up early to discover that the Easter bunny visited our house and he hid eggs in the yard! That crazy bunny– or crazy daddy! There was a little bit of dog poop on the sidewalk that someone forgot to pick up, and we told the boys to be careful not to step in it. 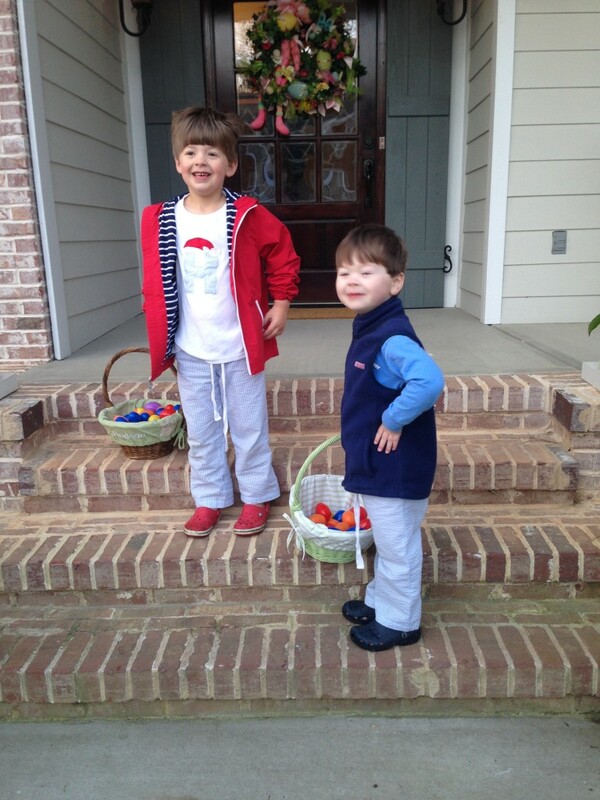 But we didn’t say it was dog poop, so Hayes kept saying, “That Easter bunny pooped on our sidewalk! !” He was pretty upset about it. We got a good laugh out of it. We rounded up our crew and went to church. It was a great Sunday at church as we celebrated the resurrection of our Savior. I love the excitement of Easter Sunday at church, but I honestly feel the same way on Easter that I do every Sunday. Just so full of gratitude for the sacrifice and the hope and freedom that we have as a result of knowing and having a relationship with Jesus Christ. After church, we all came back home and had lunch with my parents and Todd’s parents and grandmother. Then we played a rousing game of BINGO. It was a great day! I’m so thankful for the three little boys in that picture. I can’t believe there are three of them! 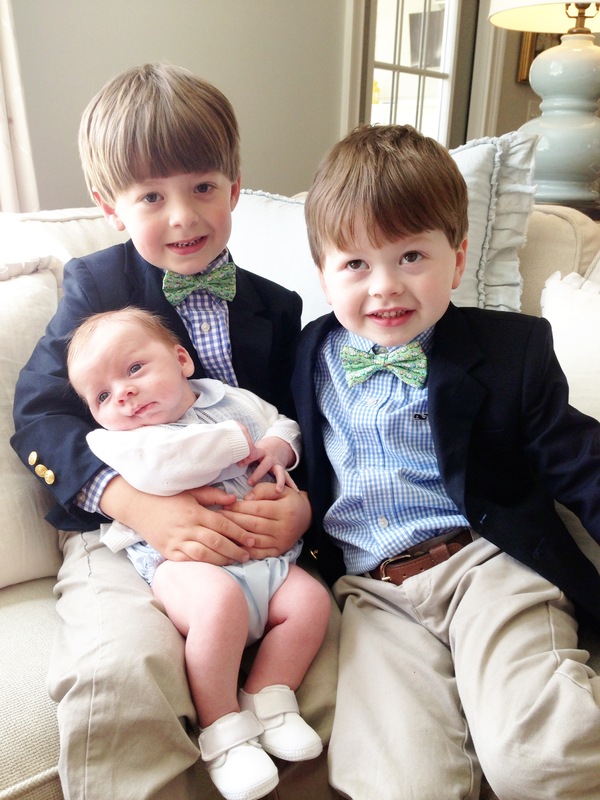 Your boys look like little studs in their jackets and bow ties! I love it! What a nice Easter! 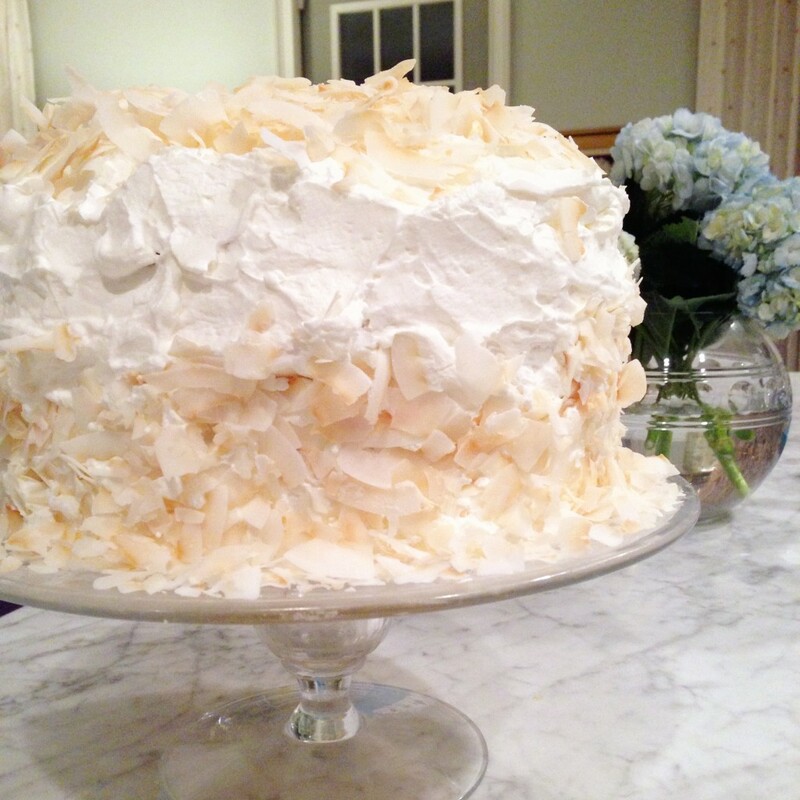 The cake looks beautiful – I feel the same way about the texture of coconut, but I love the flavor. Your boys are absolutely precious! Happy Easter! What a great weekend! I am with you about the texture of coconut, but I like the flavor. Might have to try this cake. Love the picture of all three boys! Handsome little fellows! Love the bow ties too. Your “my 3 sons” are precious! That picture of your three boys! 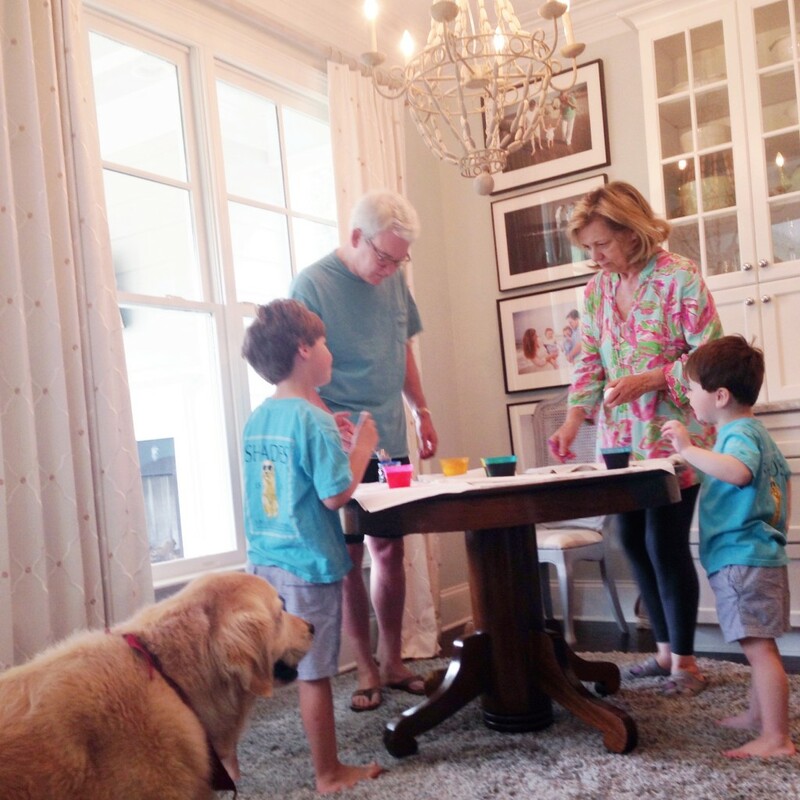 Soo glad you had a relaxing and blessed Easter weekend with your families! I am thinking I need to make that cake soooon. Your boys looked so cute! I’m glad you had a nice Easter! Random question: I LOVE the shirt your mom is wearing. Where did she find it? Thanks!